This is a wall mounted sign that can be lawn mounted with optional Comfort House Address Sign Lawn Stake available on Amazon. Number size shown in customization generator is not representative of actual size you will receive; main image provides better idea of finished product. If 2 number/characters, they will be 4" tall. If 3 number/characters, they will be 3.5" tall. If 4 number/characters, they will be 3" tall. Comfort House address sign CO69NB. Address sign holds 2, 3, or 4 large numbers or characters. Made in USA. Characters are permanently engraved into the sign during the production process, not painted or printed on. Made from sturdy UV-stabilized 1/8" laminated acrylic. Eight vivid color combinations: sky blue with white characters; black with white characters; white with black characters; brushed gold with black characters; brushed stainless with black characters; kelley green with white characters; red with white characters; and yellow with black characters. Oval shape. 9"W x 6"H x 1/8" thick. Two 3/16" diameter mounting holes. Mounting screws included. See below for lawn mounting option. Comfort House # CO69NB Oval Address Sign. Larger sizes and other shapes available. If you have any questions about this product by Comfort House, contact us by completing and submitting the form below. If you are looking for a specif part number, please include it with your message. Gzhihine Wall Scroll Lake House Decor Collection Snow Covered Maroon Bells Autumn Trees Mountain Reflection on Lake Scenery Wall Hanging Green Blue White 24"x67"
Comfort House Metal Address Plaque Personalized With Arch Top. Display your house number and street name. 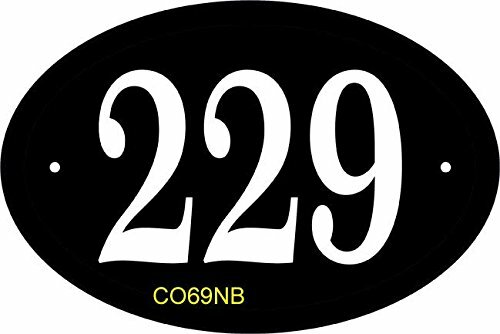 Custom house number sign 67813F2 wall mount. Gzhihine Wall Scroll Fantasy House Decor Collection View Of Fantasy River with A Pond Fish And Mushroom Jungle Trees moss eden Wall Hanging Green Teal Red 24"x16"
Gzhihine Wall Scroll Fantasy House Decor Collection View Of Fantasy River with A Pond Fish And Mushroom Jungle Trees moss eden Wall Hanging Green Teal Red 24"x67"
Gzhihine Wall Scroll Fantasy House Decor View Of Fantasy River with A Pond Fish And Mushroom Jungle Trees moss eden Wall Hanging Green Orange Red 24"x16"
Gzhihine Wall Scroll Fantasy House Decor View Of Fantasy River with A Pond Fish And Mushroom Jungle Trees moss eden Wall Hanging Green Orange Red 28"x14"